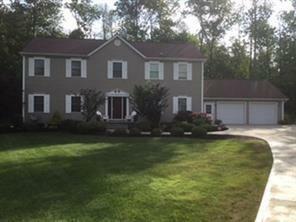 Beautiful lake area home on just over an acre partially wooded lot. Watch the sunsets and walk the beach after you purchase 2900 square foot, four bedrooms/2.5 baths (jetted tub), home with huge master bedroom and large closets throughout, spacious living room with gas fireplace, gorgeous maple kitchen with island and stainless steel appliances, first floor office and laundry room. Plenty of storage in the over-sized 2-car attached garage, attic or basement with extra high ceiling, ideal to finish into additional living space. Bonus, central air conditioning, central vacuum, security system, concrete driveway and spacious deck off the back of the house. Deeded lake rights for lake access! Fabulous lake area community.